Koi are one of the most popular species of fish to be kept in ponds and water gardens. They are also extremely costly to acquire, which means the consequences of them becoming sick are devastating, particularly if they succumb. Below are some early warning signs that your koi are not feeling well. Most koi illnesses result from interactions which occur between a pathogen, virus, parasite, bacteria and the environment and host. These illnesses may be either noninfectious or infectious, which is dire for the entire pond. The illness will threaten the natural defense mechanisms of the koi through infiltration, spreading and distorting their normal functioning. 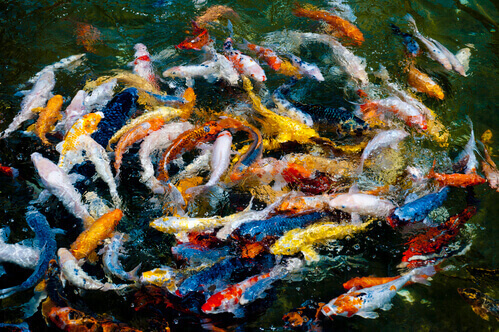 Most noninfectious koi diseases are caused by nutritional problems or toxins in the environment. Koi, like all fish, are cold blooded, and this means that their whole metabolism and response to disease will depend heavily on the temperature of the water in which they reside. This will influence pathogens and their ability to operate. Another factor that must be considered when talking about koi disease is the impact of stress. While stress is generally considered to be a good thing among most life forms because it stimulates positive change and behavior, it is a problem for koi as they are restricted to a pond where their ability to escape or respond to the source of stress is limited. The longer they are exposed to this stressful source the greater the chance their immune system will weaken and make them susceptible to illness. When koi are under significant stress they will begin producing lots of mucus. This mucus is used as a defensive mechanism, but should also be seen as a warning sign that changes must be made in the way you care for them. Providing a pond environment which is stress free for koi and other fish is not easy, since oftentimes the pond itself is the source of the stress. Another sign that your koi are not well is if you notice them jumping. They don’t do this for joy; they do it because they are attempting to get greater oxygen, and is also a sign that they may have damage to their gills. Koi will jump frequently when their pond has excessive TDS levels, or heavy metals and other materials which irritate them. Koi have a particular distaste for copper, and will begin swimming erratically whenever it is present. Chlorine is commonly used in swimming pools but should never be added to koi ponds as it will burn their gills and make it hard to breath. The first step in keeping your koi healthy is to maintain optimal water quality. Green water should be avoided and it should be set to a temperature which is most comfortable for them. Furthermore, koi need their space so you should never place too many of them in one area as this will cause problems as they grow in size.